Special Offers > Special Offers > Square Metal Keyring - SPECIAL PRICES!!! 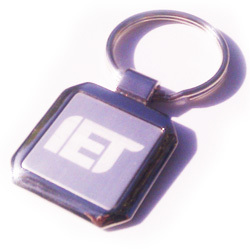 This key ring has a high quality polished metal fob in a square shape with bevelled edges. The brushed metal interior panel of the fob provides an excellent area of 20mm x 20mm which is ideal for laser engraving. The key fob is 30mm square and the key chain hoop is 30mm in diameter. Just 45 pieces left at the special price below. Square Metal Keyring - SPECIAL PRICES!!! High quality square polished metal promotional key ring. Printed with your logo by BrandHK.